Police investigating an armed robbery at a Leicestershire jewellers have released CCTV images of a man wanted in connection with the incident. 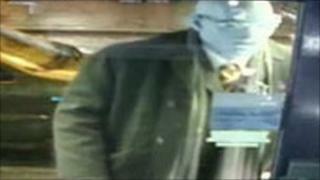 The man entered Robinson's Jewellers in Church Street, Lutterworth, just before 1455 GMT on 16 December. He threatened staff with a hammer and what is believed to have been a firearm and stole jewellery from a display. A security guard managed to grab a bag containing the jewellery but was assaulted and suffered head injuries. The suspect escaped in a black Kia Sportage 4X4 vehicle which was being driven by another man, police said. The offender has been described as dark-skinned and about 6ft (1.83m) tall. He wore a latex mask over his face, wore narrow-rimmed glasses and was smartly dressed. Det Insp Dave Richardson, of Leicestershire Police, said: "Although we don't advocate that people put themselves at risk in these situations, the security guard is to be commended for his brave actions in trying to stop the offender and I am relieved that he did not suffer any serious injury. "I would urge people to have a look at the images and contact the police if they recognise anything about the man or his clothing, even the slightest of detail could help us. "We are also keen to speak to anyone who was in the Church Street area on Thursday afternoon and saw the vehicle or the occupants acting suspiciously."